My Photo of the Day - A Mothers Love. The Hand of a Child. Home > Debt Articles > Steve's Blog > My Photo of the Day – A Mothers Love. The Hand of a Child. A Mothers Love. The Hand of a Child. 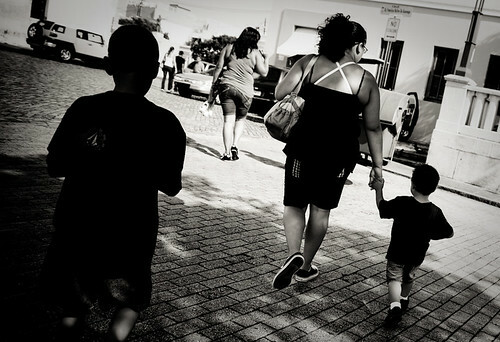 As I was walking the streets of Old San Juan, Puerto Rico I walked up on this mother and her children crossing a street. Having no time to raise the camera I literally shot this image from the hip. I knew it was going to be at an odd angle and that I could straighten it in processing but I actually like the angle, so I left it. What struck me was the innocent grasp of the hands of the mother and son with what appeared to be his older brother walking behind and an older sister walking ahead, not wanting to be uncool and walk right with mom. I also thought the white bra straps on mom drew my attention with the contrast and that led the eye down the arm to the loving grasp.